According to the Q2 2016 Proxbook report, there are more than 8 million proximity sensors deployed globally and the majority of these sensors (6 million) are beacons. The proximity and location-based industry continue to be very attractive to investors now that $220.7 million has been spent on different projects to date in 2016. Proximity sensors are being used in different industries, from retail to shopping malls, events, airports, stadiums and the hospitality and tourism sectors, among others. These sensors have the capacity to play an important role in the future of the travel industry. As we know by now, more travellers seek experiences during their journey and hotels, airlines, airports and tourist places have the opportunity to embrace location-based technologies for enhancing the traveller experience. Through proximity sensors, tourist destinations can provide visitors with a contextual mobile experience during their stay by allowing them to bookmark attractions before their visit and receive alerts when they are in proximity of one. They can also generate new revenue opportunities for local key players like hotels, restaurants, tour operators, attraction parks, stores, etc. Additionally, beacons can provide a richer and in-depth understanding of visitors’ behavior during their journey. This useful information can be used to better distribute the tourist routes inside the cities and to create different segments according to their preferences which allow the visitor to adapt the content provided to each segment. In order to become a smart destination, the Foundation Visit Benidorm has incorporated a new network of beacons throughout the city. The project is supported by the participation of Appcadia, Turiskopio and MOCA. On the one hand, Appcadia, a leading developer of mobile applications for tourism and governmental institutions, together with marketing agency Turiskopio, develop the app Visit Benidorm, which is available for free for IOS and Android devices. And on the other hand, MOCA, has installed its SDK in the app, allowing vastly improved communication and interaction with the tourist through hyper-targeted marketing campaigns based on their location. Also, by gathering information and analysing their behavior in real time, this solution provides the ability to adapt communications to the specific needs and interests of tourists. These companies are providing their technology to turn Benidorm into the most intelligent tourist destination in Europe. The beacons were placed in "strategic points" of the urban and natural environment of Benidorm, such as the Serra Gelada, the old town and the beaches. In this way, depending on tourist location, information about culture, nature, beaches, history, sports, events and leisure are displayed. As many people arrive in cities without data plans and oftentimes public WiFi doesn’t work very well, the experiences are delivered offline using beacons and geofences as triggers. This way, tourists just need to activate Bluetooth or enable location to be able to receive the information. Other examples of touristic destinations using beacons technology are The City of Michigan and The State of Queensland in Australia, where 150 beacons have been deployed at major tourist destinations throughout the city like airports, visitor information centres, national parks and other popular tourist attractions. In Michigan, 500 beacons were spread along the North Central to trigger specific and historical information to mobile devices. The President of Visit Benidorm, the mayor Toni Pérez, points out that “Benidorm is a pioneer in Spain in the application of this system of beacons to tourism management and that with the implementation of this tool, Benidorm gives an impressive qualitative and quantitative leap in the management of touristic information as well as gathering valuable information on visitor behavior, such as determining how long a visit is to a particular location." Manuel Bas, Director of Appcadia, explains: “Benidorm is a landmark in world tourism, and it is very important that the city integrate technological innovations which can add value to their visitors. We are excited to be part of this innovative process that has also allowed us to lead this project, which includes such important companies in their respective sectors, such as MOCA and Turiskopio Group. " The CEO and Co-founder of MOCA, Maria Fernanda Gonzalez, says: "A smart city needs the collective knowledge to provide personalized value to visitors. Benidorm has decided to make this challenge real. We are very proud to be part of this important moment for the city and able to carry out such innovative projects with leading companies like Appcadia and Turiskopio. " 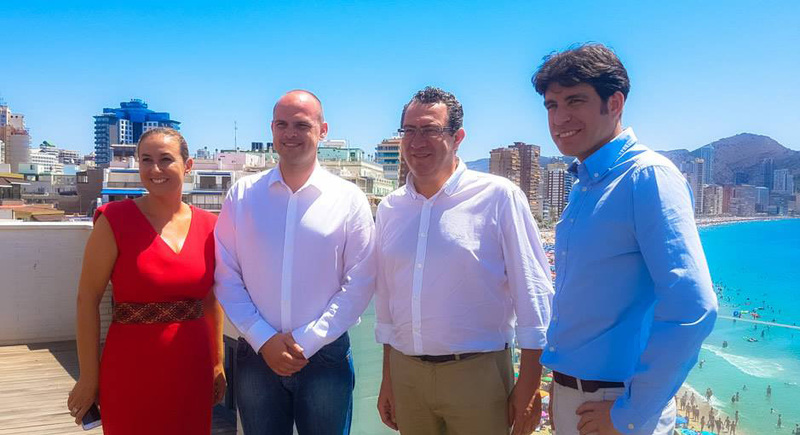 Benidorm has established its leadership and become the first European destination to use beacon technology for tourism purposes. Nowadays, the smartphone is one of the most essential elements for a traveller and tourism industry needs to rapidly adapt new technology to be able to communicate at the right time and place with the visitor.